← Who Was The 44th US President? One of the topics during the 2012 Presidential election is entitlement spending and whether we need to reform these programs (Social Security, Medicare, Medicaid, Welfare, Food Stamps and Unemployment Insurance), keep them in their current state or expand them. In this blog post I hope to show why reforming these programs and changing our philosophy about them is important and I’ll use a simple thought experiment to make my point. But first let’s review a couple of things. As I’ve stated before, this election comes down to two competing philosophies about the role of government and specifically, about the role of entitlement programs. Conservatives believe that lowering our corporate income tax rate (which is the highest in the world) and lowering the taxes on the 53% of eligible taxpayers who actually pay Federal income taxes will stimulate the economy and get people back to work. Removing the business killing over regulation and the sword of Damocles (Obamacare) that is hanging over business, forcing layoffs and hindering growth will enable the economy to expand and allow people to get back to work. It is basic economics and a demonstration of the Laffer Curve – More people working will raise more tax revenues for roads, bridges, entitlement programs, etc. Eventually we will run out of tax payers who can fund the government outlays (see Greece) and America will eventually either embrace individual responsibility or slip off the slope and go the way of European socialism. It is Conservatives’ belief that it is more humane to get people off Welfare, get them a career and let them plan for their future than shackle them into a lifetime of government dependence. 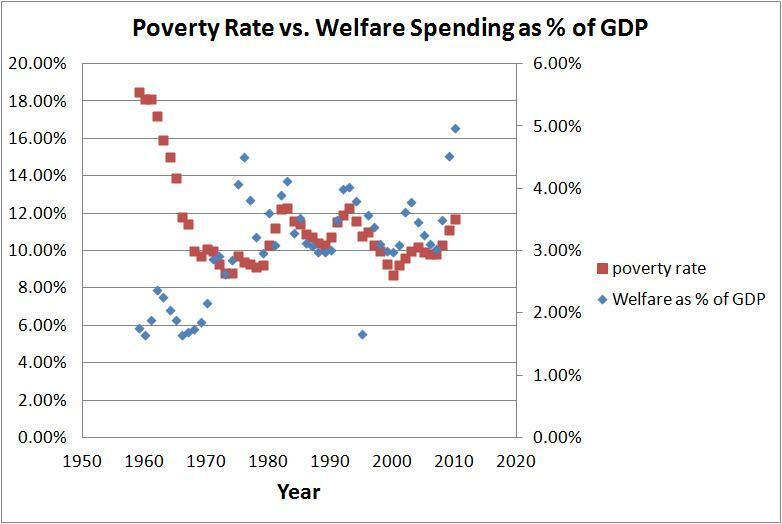 Welfare has not changed the poverty rate and similar out of control entitlement programs that once were viewed as safety nets have changed into systems that enable poverty and government dependence for tens of millions of American citizens. 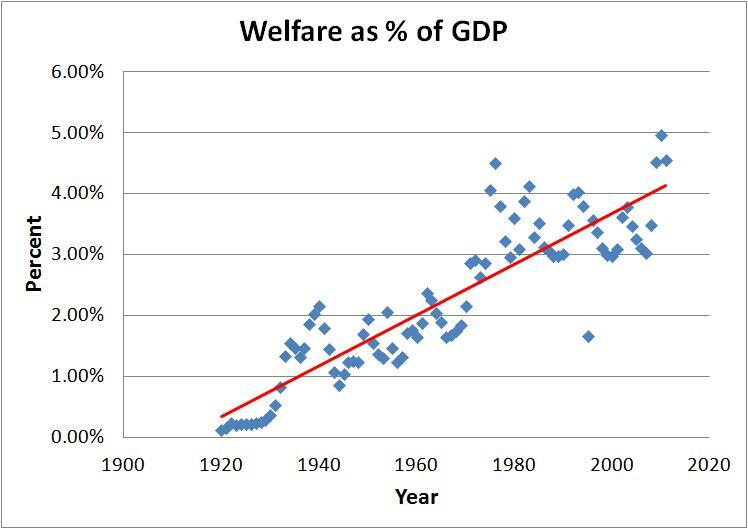 Here are a couple of graphs that prove those points regarding Welfare. Suppose you are given a magic wand that can do one of two things. 1) You can magically raise taxes on corporations and individuals to increase the money available for Welfare (which is currently around $700 billion) and the rest of the entitlement programs (which amounts to over 90% of all federal income tax revenues) and ensure that there is always plenty of money available for these entitlement programs to keep more people dependent on government assistance. 2) You can magically change the economic landscape that results in businesses growing to the point where they need to hire, which will cause a vast majority of people currently on Welfare, Food Stamps and Unemployment Insurance to obtain good jobs. I think most people would choose option #2 because that would allow people to have the freedom to make their own decisions with regard to what they purchase, how they invest in stocks/bonds, how they pay for their children’s’ education and how they plan for their retirements. This option would also increase the overall tax revenues because more people would be paying federal income taxes and less people would be receiving money from the US government in the form of Unemployment Insurance, Food Stamps and Welfare. A nation where a vast majority of adult population is fully employed would cause a budget surplus, allow the federal government to pay down its debt (which is currently over $16 trillion) and put America back on a path that provides a better future for our children. Team Obama and other Leftists clearly choose option #1 but Romney and Conservatives have plans that more closely resemble option #2. My question to the American people is simply this – Why would you vote for someone whose policies will favor government dependence over individual freedom? This entry was posted in economics, Entitlement Programs, politics. Bookmark the permalink.